Thousands of dollars in donations are now pouring in to help find a home for a homeless 8-year-old Christian refugee who fled persecution with his family from Islamist sect Boko Haram in Nigeria, after he beat wealthier competitors to win New York States primary chess championship. The boy, Tanitoluwa Adewumi, who is affectionately called Tani, is currently living with his family in a homeless shelter in Manhattan and only started playing chess just over a year ago, according to an op-ed by The New York Times Nicholas Kristof. 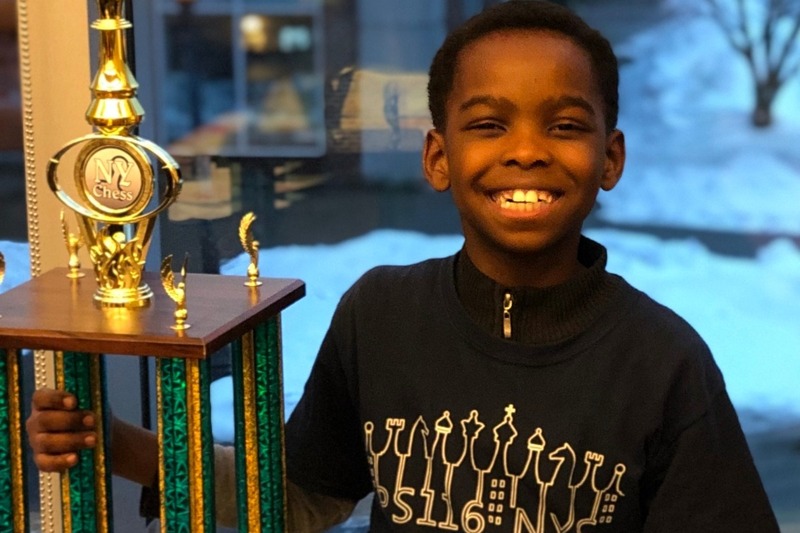 Tani who is the new state chess king of the kindergarten through third grade level was undefeated at the state tournament earlier this month where he outsmarted children from elite private schools with private chess tutors, Kristof said. But he has a bigger ambition. I want to be the youngest grandmaster, he said. The young refugees family fled Nigeria in 2017 because of the ongoing terrorist attacks on Christians. Such violence often results in the loss of life and physical injury, as well as loss of property. As a result of the violence, Christians are also dispossessed of their land and means of livelihood. Christians in northern Nigeria, especially in the Sharia states, face discrimination and exclusion as second-class citizens. Christians with a Muslim background also face rejection from their own families and pressure to give up Christianity, says Open Doors USA, an organization that helps persecuted Christians in 60 countries. I dont want to lose any loved ones, Tanis father, Kayode Adewumi, told Kristof. The familys asylum request in the U.S. is still pending with a hearing scheduled for August. In 2018, more than 6,000 Christians had been killed or maimed by Islamist terrorists affiliated either with Boko Haram group or the Fulani tribesmen, whose anti-Christian terrorism remains unchecked by Nigerias government. Tani, his older brother, and his parents moved to New York City more than a year ago, according to Kristof, and a pastor directed them to a homeless shelter. He soon started attending P.S. 116 where a part-time chess teacher taught him how to play chess. With the blessing of his mother, Oluwatoyin Adewumi, he joined the chess club. When he took part in his first chess tournament a year ago, Russell Makofsky, who oversees the P.S. 116 chess program, said Tani had the lowest rating of any participant, 105. His rise since then, however, has been meteoric. His rating is now 1587 and continues to improve. To understand how well Tani is doing, Kristof noted that the worlds best player, Magnus Carlsen, has a rating of 2845. Its an inspiring example of how lifes challenges do not define a person, Jane Hsu, the principal of P.S. 116, which held a pep rally to celebrate Tanis victory, told Kristof. Hsu explained that even though his family currently does not have a home, his parents have worked hard to ensure that he succeeds. His father currently works two jobs while his mother recently completed a course to become a home health aide. Two days ago, Makofsky launched a GoFundMe campaign to help raise money so Tanis family can find a home. As of Monday morning, nearly 1,400 people had donated almost $100,000 and counting. I welcome this family and join them in wanting to help grow this boys talent. The family is inspiring and strong and an example of how welcoming immigrants has built this nation and added immeasurable good to our communities, wrote one donor on the campaign's site. Great story of a Christian refugee showing such talents. Nice of Olivia Wilde to donate, though I’m not familiar with her acting. I love chess. I’m no good at it but I watch a chess channel called “agadmator” where he simplifies and gets down on my level. I applaud this kid. I can never achieve what he did. Nigerian immigrants tend to be very hard-working people whose culture greatly values education and strong family values. In fact, there's a backlash against Nigerian students at some Ivy League schools because they tend to be taking up slots (despite the claim that no quotas exist) meant for other black students. His father currently works two jobs while his mother recently completed a course to become a home health aide. Why do they always come to the most expensive worst run city in the country? If you want to live there today with any kind of a life, you basically have to make a salary in the mid 6 figures. So why are they dumping this family in a homeless shelter? There are so many other places all around the country where housing is so much more cheaper than that hellhole and you won’t have to deal with the creeps out on parole that the left spews out everyday with their revolving door brand of justice. People get killed in those shelters all the time. I have also known some very fine Nigerians. Two of them, great engineers. Grandmaster is the highest Chess title. I can barely win against the built in game on my Windows 7 laptop. At present, maybe an 8 percent victory rate. I play fair openings, but by the middle game I’m flummoxed. My end game? I once took some blowhard’s queen in about 10 moves. Otherwise, I’ve never made it that far. Wait till he takes on a Russian. In my mid 20s, I became obsessed with chess. I would play through old championship games on my chessboard, subscribed to Chess Life magazine, studied books on strategy and played everyone who would sit down to play. My favorite openings were Ruy Lopez for white and Sicilian for black. I loved chess, but I was never very good at it. A good player can see many moves in advance. I could only see 2 or 3. Still love the game, but weak chess programs now beat me regularly. This was on TV last night on cBS I think. Said the boy was a ‘refugee migrant’, never said he and his family were Christians and refugees from the muzzards in Nigeria. His asylum request is PENDING?? While 100k pendejos get instant “asylum” at the border? Ridiculous. Can Trump sign an EO giving this kid asylum? The story mentions Magnus Carlsen as the world’s best player. I saw a video of him as a teenager when he played 10 simultaneous games with his back to his opponents. With a little work maybe that can be you! Russians are selected and groomed early in life. They generally dominate in country sponsored tournaments. Try agadmators channel on Youtube. I have learned a lot but I will never achieve greatness. A good player can see many moves in advance. I could only see 2 or 3. That's the key. That's why I will always be mediocre at best. Lichess.com You can play others, against the computer or preset challenges. Just a stereotype, I know, based on a very limited survey: but all the Nigerians I have known have been good-looking, intelligent, and ambitious.